This entry was posted on Friday, May 10th, 2013 at 1:58 pm and is filed under Uncategorized. You can follow any responses to this entry through the RSS 2.0 feed. You can leave a response, or trackback from your own site. 6 Responses to Couple InterPlay! Jurgen says, it all started with lying next to each other on the floor on December 31, 1999, a little before midnight, to ground the energy of the coming Millennium. On the first day of the Millennium, we walked the labyrinth together at Grace Cathedral. We were the only two of the Millennium retreat who chose that as our activity. Now we walk it pretty much every New Year’s Day. We only missed when having babies or traveling to Germany. Thirteen years later, happily married, two playful kids (Amy,10 and Toby, 8). Still dancing, like the other day in the kitchen, when we let lose to “Call Me Maybe.” Amy and Toby thought it was a little weird, but we tell them they’ll understand later. Fred and Harriet rock!!!! – play brings life and love to any moment – even when going to doctors, love to you both! 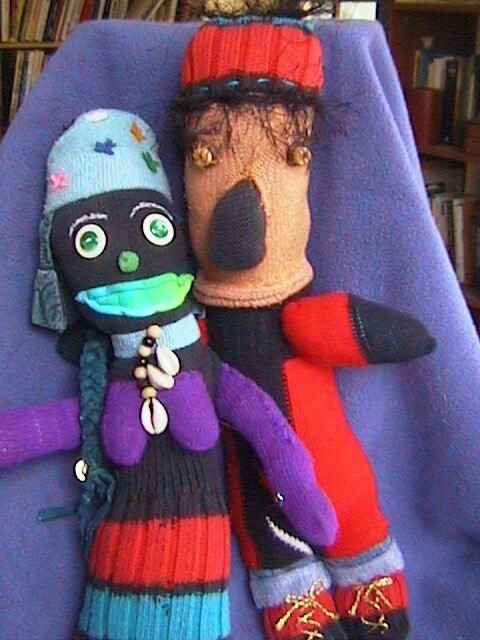 The wonderful dolls are made by InterPlay leader Gay Guard-Chamberlain! One of my favorite couple moments… some years ago my husband & I attended a spiritual retreat for couples. The weekend’s activities culminated in the facilitators inviting all to have a dance with their partners, Doug & I did it as a hand dance, something we often do. Later the workshop leader told us he couldn’t take his eyes off the two of us, he found it so moving & beautiful in its simplicity & depth. Ahhh, the power of two hands dancing!